Jeremiah McCutchen was just one of more than 40 riders who showed off their skills during the 13th Annual Rosewood Rodeo held Oct. 7 at the Barton County Expo. Jeremiah sat tall and proud on his horse as he waved and smiled to the crowd. His parents, Susan and Brett, beamed with pride as they waved back and took photos from the bleachers along with many other parents, guardians and guests. 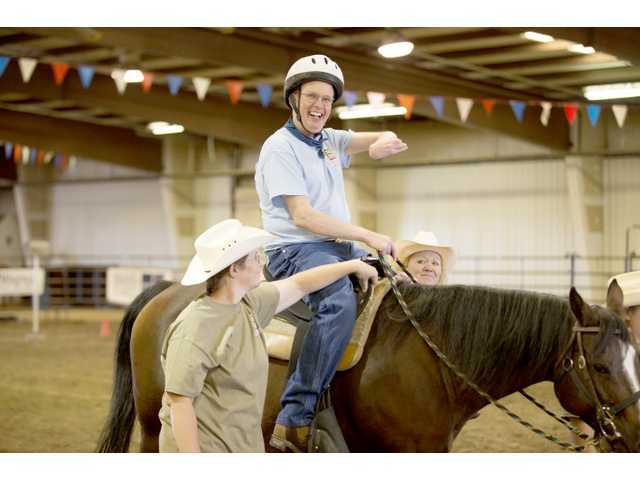 “Before he began attending the Rosewood Horse Therapy Program, Jere would just sit still; he was not engaged,” Brett said. “This wonderful program has really helped his concentration; now he displays much more control and coordination. Because of this program, I was able to stand alongside Jere at the World Horse Show in Tulsa as he was awarded the World Championship trophy in his class.” The Rosewood Equine Therapy Program, which operates year around, allows riders of all abilities to practice and improve their skills while enjoying being on a true working ranch. It is only one of the varied opportunities Rosewood offers to its clients on a daily basis. Jeremiah McCutchen waves to his parents while competing in the 13th Annual Rosewood Ranch Rodeo on Oct. 7 at the Barton County Expo. The 40-plus riders competed in several different rodeo classes, while being carefully judged for their performances. At the Awards and Recognition Ceremony, the shared enthusiasm as winners were announced was evidence of the level of respect and camaraderie the participants have earned through competition and performance. Rosewood’s Rodeo, which is sponsored by nearly 20 local businesses, is also made possible by the efforts of many volunteers, staff, and client family members. The day was filled with fun events for all, including wagon rides, face painting, kids games and tasty rodeo food. The Rodeo began with special guest the Hon. Dan Biles of the Kansas Supreme Court delivering the opening invocation, then professional rodeo announcer Rob Emery took over the microphone as the emcee of the day’s events. The day ended with the traditional Rosewood Rodeo Barbecue.